Rear firebrick for AGA Little Wenlock stoves. Will also fit the Stanley Shire Stove. Dimensions approx 293mm (11.5″) width x 195mm (7.75″) height x 30mm (1.25″) depth. 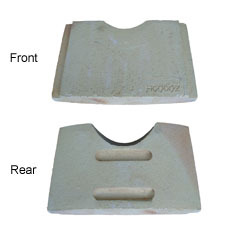 This firebrick has a curved rear face and replaced the earlier flat backed brick.